Drum Loops HD is a great way to add live acoustic drums to your musical projects. 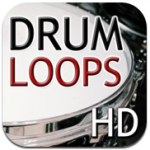 This app allows you to choose from approximately 700 drum loops (488mb) for only $10. You get 7 styles all based on what is needed to program a great track. The bpms have been carefully chosen and are commonly used tempos in modern music production so that you won’t have to time stretch them too much to get your desired BPM. All loops, fills, and hits can be copied directly to your pasteboard for use in multi-track app that support copy/paste. Some apps that support copy/paste are Garageband, FL Mobile Studio, NanoStudio, Studio.HD, Beatmaker 2, and Groovemaker. All loops have been cut into in either 2 or 4 bar loops and have been recorded simultaneously in two explicitly different microphone settings; a ‘modern’ (close miking with room ambiance) setting of 14 mics and a ‘vintage’ mic setting of in total 5 mics around the set. This means that you can use different sounds for verse/chorus/bridge/intro (with fills to glue it together) by either using the same loop in different sounds or using different loops for the respective parts of your song. A separate chapter has been included with cymbal hits, cymbal hits with kick, cymbal rolls and endings (big fills) to complete a full drum part played by a real drummer. 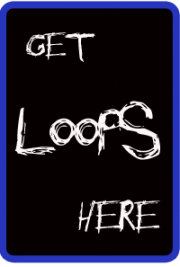 Drum Loops HD has over a 1000 real drum loops, fills & samples to use with your digital audio workstation – a.o. Garageband, Auria, Cubasis, Music Studio, Multitrack Daw – (plus AUDIOBUS SUPPORT). Nothing is programmed or synthesized, but played live by Hans Eijkenaar, Holland’s first call session drummer. All recorded with state of the art modern and vintage mics and automatically looped within the app. * Copy/paste to your favorite multitracker! * Many styles in many bpms (check content list) including unique Jazz loop library! * 4/4, 6/8 loops and shuffles, brushes loops, loops in straight time and shuffled time. * Audio quality: 44.1 khz, 16 bit (cd). For copying to any multitracker including GB. All 8 styles are cut into either 2 or 4 bar loops and recorded with two different mic settings, a ‘Modern’ with 14 mics and a unique ‘Vintage’ setting with 5 old school mics placed around the sets. With all of these choices, you have a real, live drummer at your fingertips to add to any piece of music. And, to make your track complete, ending drum fills (pop and jazz), crashes and double crashes are incuded to make your track the real thing! Drum Loops HD is not just great for creating music, but it’s also perfect for practice sessions. If you need to learn a new style or work on your rhythm and timing, just pick a loop and play along. Practice makes perfect, and the Drum Loops HD drummer is perfect every time! And the upright bass player can study with a swinging jazz drummer! Don’t settle for an app that gives you programmed drum-like sounds. Download Drum Loops HD now and put a real drummer in your GarageBand!